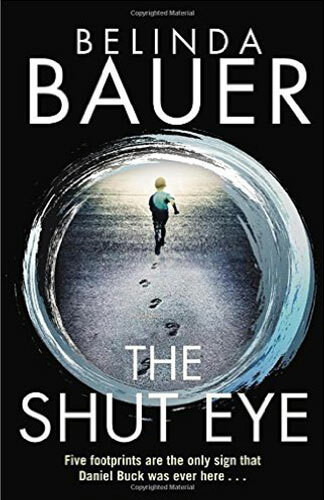 Belinda Bauer’s favourite plot-line is the serial abduction of children or young people, and her most effective mode of narration is through the eyes of a child or young adult. In The Shut Eye these two strengths converge. Some of the story is told from the point of view of an abducted girl held captive in the suburbs south of London. As an enthusiast for all things outer space, twelve-year-old Edie Evans imagines she has been abducted by aliens. She keeps her spirits up by drawing with crayons on the walls of her spaceship aka tiny concrete room. Some other chapters are told from the point of view of a young mother, Anna Buck, whose little boy has vanished. Like Edie, Anna copes with the help of fantasy and vain hopes. The baby Anna carries with her is perhaps a doll, and the clairvoyant (or ‘shut eye’) she visits is suspected of being a charlatan. Anna’s husband, James, maintains a remarkable level of forbearance considering the increasingly bizarre nature of Anna’s behaviour. He continues working close to home, in a motor repair workshop with a motley crew of grease monkeys whose backgrounds bring international currents into what would otherwise be an insular tale. This time around, Bauer invests the police with moderate capability, inventing a hardened older detective, John Marvel, who is grumpy, rude and laconically droll, in the time-honoured tradition of English cops. Predictably sceptical in regard to psychics and derisive in regard to adult women, Marvel has little sympathy for Anna, who is labelled crazy, but has a soft spot for missing girl Edie. There’s humour at his expense when he’s ignominiously taken off his case and ordered to find a missing dog owned by his Superintendent’s wife. Fortunately for Marvel, the Superintendent’s wife has resorted to visiting the same psychic that Anna saw. Shortly – after a side-trip to Battersea Dogs Home and the adoption of ‘a dust-bunny with legs’ that takes over his sofa and commandeers his girlfriend’s affections – Marvel is back on the trail of the missing children. With this being essentially a sweet-and-sad mystery, one reads on in the expectation that the children will be recovered. And they are found, as is their abductor, but the outcome is not happy closure for everybody. The Shut Eye is cleverly constructed and is written in plain, direct but not pedestrian prose, with plenty of dialogue. It’s popular entertainment as it should be.